Dempsey, Daniel V.. "Snowbirds". The Canadian Encyclopedia, 04 March 2015, Historica Canada. https://www.thecanadianencyclopedia.ca/en/article/snowbirds. Accessed 26 April 2019. The Snowbird legacy is part of a rich air show tradition in Canada that began nearly a century ago. Ever since J.A.D. McCURDY coaxed the SILVER DART into the air in Baddeck, Nova Scotia, on 23 February 1909, Canadians have been fascinated with airplanes and their role in shaping the nation. Snowbirds in flight (courtesy Dan Dempsey). Canada's Snowbirds are officially designated "431 Air Demonstration Squadron" of the Canadian Forces. Since 1971, the team has demonstrated its aerial magic across North America before audiences now totalling more than 3 million. They have been recognized as among the best in the world at precision formation aerobatics and stunning solo crosses with minimum separation between the aircraft. As aerial ambassadors for Canada the Snowbirds have proudly flown the Canadian flag all across North America, from the far reaches of the Canadian north to the Gulf of Mexico. They have created their own legacy within Canada's aviation heritage. In the hearts and minds of millions of Canadians, the Snowbirds are symbols of national pride. 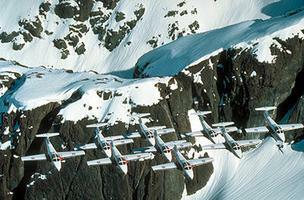 The Snowbird legacy is part of a rich air show tradition in Canada that began nearly a century ago. Ever since J.A.D. McCurdy coaxed the Silver Dart into the air in Baddeck, Nova Scotia, on 23 February 1909, Canadians have been fascinated with airplanes and their role in shaping the nation. Early heavier-than-air machines, constructed of fabric and wood, fired the imagination. Before long American and Canadian barnstormers were thrilling audiences with their daredevil feats - low flying, loops, rolls and eventually inverted flight. Aerial circuses became highlights of Canadian summers, evolving over many decades into an impressive air show industry; as spectator events in North America, air shows are second only to national league baseball. The first known aerial formation demonstration in Canada took place in 1919 at the Canadian National Exhibition (CNE) in Toronto. Since this followed the end of World War I the team was suitably led by Canada's most decorated fighter ace, Lieutenant Colonel William G. Barker, VC, DSO, MC. He and 3 other veterans of the air war over France and Germany flew daily performances at the CNE, flying captured Fokker D.VII "war trophy"aircraft. In 1929, only 5 years after the Royal Canadian Air Force was established on 1 April 1924, Canada's first official aerobatic team, the Siskins, was formed at Camp Borden, Ont. They flew for 4 seasons, most notably in 1931 during the "Trans Canada Air Pageant" when thousands of Canadians across the land were able to see their air force in action, many for the first time. From the Siskins grew a variety of teams across Canada, as well as the RCAF's "1 Air Division" in Europe in 1953. Teams such as the Blue Devils, Easy Aces, Prairie Pacific, Sky Lancers, Grey Ghosts (Royal Canadian Navy) and the Red Knight are but a few of the performers who have demonstrated Canadian aerial prowess over the years. If the Snowbirds owe their legacy to any one team, it is the RCAF Golden Hawks, formed in 1959 to celebrate the 35th anniversary of the RCAF and the 50th anniversary of powered flight in Canada. The Hawks flew 317 public air displays over 5 seasons before being disbanded on 7 February 1964 due to government budget cuts. However, the Golden Hawks had generated much publicity and goodwill across North America, and their popularity led directly to the formation in 1967 of a new team, the "Golden Centennaires," which helped Canada celebrate 100 years of nationhood. The Centennaires featured a team of 8 Canadair CT-114 Tutor jet trainers complemented by a pair of vintage Avro 504K biplane trainers, a supersonic fighter duet comprising the Canadair CF-104 Starfighter and McDonnell CF-101 Voodoo, and finally, the famous Red Knight in his Canadair T-33 Silver Star. By the time the centennial year ended the team had set a single season record for the most shows, having flown 100 public demonstrations in Canada and another 8 in the United States. Their 184-day Canadian tour between May and October started and ended at Expo 67, covered nearly 3 million kilometres and was seen by over 4 million Canadians. Although the Centennaires were disbanded at the end of 1967, there was a renewed belief that many Canadians wanted a permanent military aerobatic team. That message was heard loud and clear by the Centennaires' commanding officer, Wing Commander O.B. Philp, DFC, Base Commander of CFB Moose Jaw, Sask, Canada's largest flying training base and home to the air force's entire Tutor fleet. Inspired by the sight of several white Tutors on the flight line, by 1971 he had established an unofficial 7-plane "formation" team, using the white aircraft. The pilots were all experienced instructors selected from among volunteers at 2 Canadian Forces Flying Training Schools. On 11 July 1971, North America's largest one-day air show took place at Moose Jaw. Dubbed the "Saskatchewan Homecoming Airshow," its feature attraction was a team called, for the first time, the Snowbirds. (The team assumed the name following a competition among local elementary school children.) From Moose Jaw the team went on to receive positive reviews at both the Abbotsford International Airshow and the CNE in Toronto, initiating a new era in Canadian military aerobatics. While success and fame came quickly for the Snowbirds, there was a constant struggle for survival in the formative years as the team competed for funds within a tight military budget. That the team survived and prospered was due in no small measure to the outstanding public relations that the team members generated on behalf of the Canadian Forces. This manifested itself through a professional and entertaining flying display and post-performance autograph sessions, school and hospital visits, and participation in a wide range of social activities with the public. As the team's reputation grew, so did the demands for such appearances. While team members were doing their part to ensure the future of the Snowbirds, more senior officers of the Canadian Forces were working behind the scenes to extol the virtues of a national aerobatic team to senior leaders in the Department of National Defence, local and national politicians - indeed, to anyone who would listen. The team continued to operate year to year on a shoestring budget until September 1977, when the Snowbirds finally achieved a measure of permanence and were designated the Canadian Forces Air Demonstration Team. Then, on 1 April 1978, the Snowbirds achieved what none of their predecessors had done, attaining full squadron status as 431 Air Demonstration Squadron. In October 1999, 431 Squadron received its Queen's Colours, denoting 25 years of active service, first as a World War II bomber squadron, then briefly as an F-86 Sabre demonstration team in 1954, and finally as the Snowbirds. Since its inception, all members of the Snowbird team have been volunteers who have earned the privilege of representing the Canadian Forces and Canada for a 2-year tour of duty. The Snowbirds boast the smallest complement of personnel among the world's 6 premier jet aerobatic teams, largely because of a very economical aircraft that does not require dedicated support aircraft and additional maintenance personnel. The team continues to fly the Canadair CT-114 Tutor jet trainer, although the aircraft was retired as the air force's basic jet trainer late in 1999 after 35 years. Each season, half of the Snowbird team changes in order to maintain a uniform level of expertise from year to year. Up to 8 pilots are invited to participate in flying tryouts each fall in Moose Jaw, with 4 selected to fill vacated flying positions on the team. The commanding officer/team leader is chosen separately from among pilots who have flown a previous tour with the team and have attained the rank of major. Similarly, half of the team's 10 maintenance personnel change every year, with successful candidates having demonstrated superior performance in their respective fields of expertise. A team within a team, the ground crew keeps the squadron's travelling complement of 11 aircraft in prime condition. The training season, which is painstakingly methodical, commences immediately after the tryouts are completed in late November and concludes in mid-April when final training is conducted in Comox, BC. By the time the show is ready to go on the road, each of the 9 demonstration pilots will have participated in upwards of 120 practice sorties. Once the team embarks on the show season, it is a non-stop routine of transit, practices and shows for 6 months crisscrossing North America. The Snowbird show has evolved over time and for many years has been regarded as one of the most exciting displays of its kind in the world. From its humble beginnings in 1971 when the team flew 7 aircraft in non-aerobatic manoeuvres only, there have been many milestones. The first was in 1972 when 2 solo aircraft were added to the team and authorized to perform head-on aerobatics. The following year the formation was permitted aerobatic manoeuvring and in 1974 the team adopted its now-familiar red, white and blue colour scheme. The team was also the first in the world to choreograph its show to music. The show is different every year and is limited only by the pilots' imaginations and one overriding criterion: all show manoeuvres must be safe for both the team members and the viewing audience. A Snowbirds show today involves a complex series of formation aerobatic manoeuvres and splits interspaced by the low-level precision aerobatics of the 2 solo pilots, all traced in smoke so the audience can follow the intricate patterns. The level of concentration required during the show is extraordinary, with each pilot using hand, eye and foot co-ordination to maintain his relative position within a few feet of the aircraft beside him. Formation pilots experience up to 5 G during their performance, equivalent to a force exerted on their bodies 5 times their normal body weight; the 2 solo pilots may experience up to 7 G during their routine. Following the crisp commands of the team leader and lead solo, a Snowbird show is a choreographed aerial ballet that lasts approximately 28 minutes. At the conclusion of their 29th airshow season in October 1999, the Snowbirds had flown over 1630 official demonstrations before a total audience exceeding 88 000 000 spectators. Over the years they have performed at every major event in Canada, including the Olympics, the Commonwealth Games, Expo and Canada Day celebrations each year in Ottawa. They have flown at every major airshow in North America, reflecting great credit upon Canada and its military. Snowbirds Demonstration TeamThe website for the Snowbirds Demonstration Team (431 Squadron), a Canadian icon comprised of serving members of the Canadian Forces. From the Department of National Defence.